Building an email list is the best way to build a relationship with your potential customers. First, I wanted to share some statistics around email campaigns and the success associated with them. The average open rate for email campaigns across all industries is 21.8% and the average click-through rate is 2.78%. So, if your email list has 10,000 emails on it, 2180 individuals will open that email. Out of the 2180, you will have 278 individuals click a button in the email and land wherever you have asked them to land. It varies between industries and I will use retail as an example because it sits very close to the average and it’s relevant to the example I will talk about below. Retail as an industry lands at 21% open rate and 2.5% click-through-rate. If your email is not optimized to fit different size screens and devices your click-through-rate will be significantly lower. Research shows that 47% of users open an email based on the subject line. Be clear on how the recipient will benefit from the value you are offering, whether it’s content or promotional pricing. Once you get the user to open the email and click on the desired button, it is important that they land on a page that makes it easy to complete the action you wanted to complete. Simple and loud call-to-actions, solutions for the problems your audience is trying to solve and a unique value are some of the things to be included on the landing page. Too much content and navigation can create uncertainty and can cause the user to get interrupted mid-way or prompt more research. If you are a retailer, you have plenty of opportunities to capture emails at point of sale and get permission from your customers to stay in touch. Retailers that ignore email capture are setting themselves back and lose out on potential revenue. The cost of capturing emails in store is very low, if not free. Setting up an email campaign and managing your email list is not very costly and if the campaign is setup properly, with enough emails of course, it will always produce a positive ROI. If you are a multi-location, high transactional volume retailer, the speed at which you can grow your email list is much faster than a single unit, high ticket/low transaction volume retailer. We recently partnered up with a luxury eyewear retailer and helped them triple their email list. 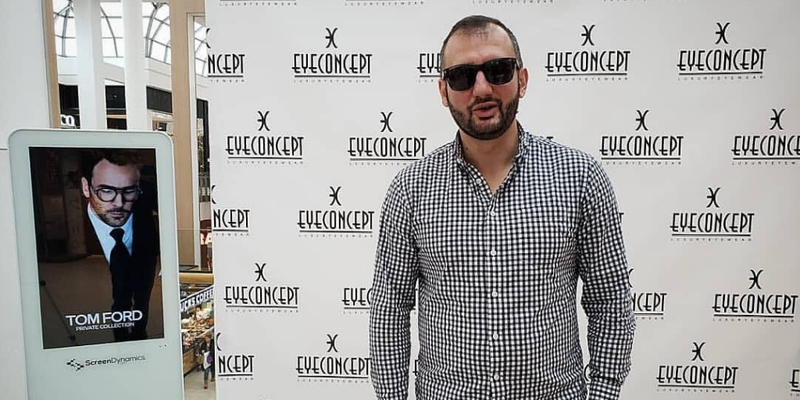 Eye Concept is a local luxury eyewear retail store, staffed with licenced Opticians and an Optometrist on-site. They are located in Oakville Place and have been there for about 6 months. We brainstormed with the owner on how to increase awareness in the community around the existence of their store, drive more traffic to the store and increase their existing email list. Knowing their goals, we planned an event that incorporated all three objectives. First, we setup an online contest that awarded two winners a free pair of Tom Ford sunglasses. Next, we secured space in the middle of the mall for two days to do a live event. Finally, we launched the contest a week before the live event and encouraged the team at the store to sign people up to the contest, not only when purchasing a product but when they just come in to browse. While the store was not busy, we encouraged the team to stand outside and engage people walking by to sign up to the contest. In order to sign up for the contest, the user had to leave their email address. Consent to be added to their email list was optional, but we found that 72% of our contest entrants gave consent to send them future promotional emails. The entrant was able to earn extra ballots by inviting friends to participate through a unique URL, or by liking their Facebook and Instagram page. This add-on helped increase our social media followers. We promoted the contest on Facebook and Instagram locally as well. On the day of the live event we setup a backdrop in the middle of the mall, brought in two digital screens that advertised the contest and setup an iPad stand to encourage people to sign up to our contest. 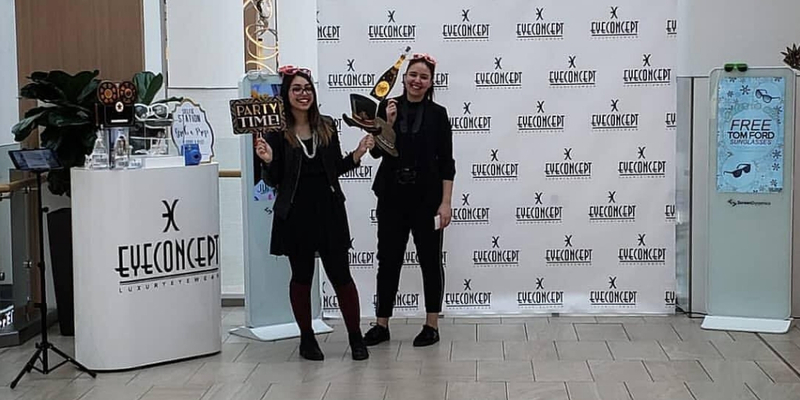 We also brought a Polaroid camera that allowed mall patrons to take a picture in front of our backdrop while trying out some models of their exclusive lines of sunglasses and some party props. The crowd was able to walk away with a good memory and a printout picture from the polaroid of them having fun under our brand. We also encouraged all visitors to go down to our retail location and receive a free gift. We had swag giveaways that we distributed to all visitors. This action allowed for mall patrons that would normally miss their store to come in, visit the store, get to know the team, the variety of products they sell and helped build more exposure around their store. The live event was on for two days and we continued the on-line contest for another week. After two weeks of total contest entries and the live event we were able to triple our clients’ email list. The total number of email addresses collected was almost an even split between the live event and the in-store/online activity. Not only did we triple our clients’ email list, we also exposed our clients’ store and brand to the local community, increased brand awareness and provided a memory for their future clients. In the following months we are able to measure the direct impact the contest and the live event had on total sales. The impact of Experiential Marketing events had been proven tough to in terms of hard data and ROI. The experience of the participants can be measured through various surveys, email sign ups/social media followers increase and many other such activities. The measurement of impact of the event on total sales and revenue however carries a lot of variables in between that can impact that number. Being a Digital Marketing and Experiential Marketing agency, we have combined the best of both worlds and have created a product that can more accurately measure the impact of Experiential/Field Marketing on total revenue and Sales. Contact us for more details. Retailors Group helps businesses with their sales and marketing efforts. We offer field marketing, on-site sales assist and digital marketing. We are Toronto SEO experts and also offer full digital marketing services like website design, PPC digital advertising, Facebook and other social media advertising, social media management and more. 2019 Retailors Group Inc. All Rights Reserved. Join our mailing list to receive the latest tips on SEO, Social Media Marketing, Google AdWords, Content Marketing and everything Digital Marketing!